119086_01 LtoR- Alma, Colene and Jill. 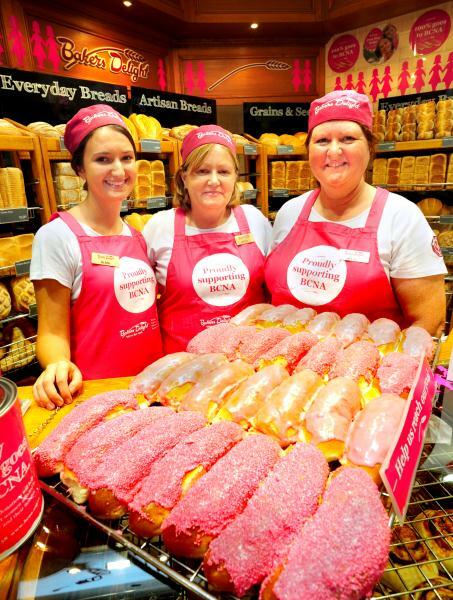 BAKERS DELIGHT stores across the Western Suburbs are turning pink in support of the Breast Cancer Network Australia. From now until 14 May, the bakers will be busy baking up the pink finger bun for this year’s Pink Bun Campaign. The annual fund-raising campaign will see around 600 Bakers Delight bakeries donate 100 per cent of the sale of pink finger buns to BCNA. “It is a really important campaign that everyone gets behind,” said Sunshine Bakers Delight Franchisee Colene Bonello. “So many people are affected by or touched by breast cancer, and it doesn’t matter your age,” she said. “I know personally my mother had breast cancer and it’s very important to me,” she said. “She was diagnosed when she was 80,” she said. Ms Bonello, and her husband George Bonello, looked forward to the next few weeks and applauded the community’s generosity. The money raised by Bakers Delight customers will support BCNA’s information resources provided to Australians affected by breast cancer such as the My Journey Kit, a free resource for women newly diagnosed with breast cancer. Bakers Delight customers are also encouraged to leave a personal message for women in the community on a ‘Pink Lady’ paper silhouette purchased for a gold coin donation. Messages of support or in memory of a loved one with breast cancer will be displayed in each local bakery during the campaign.